We would like to invite EVERYONE to come join us in the FUN and adventure of group riding and activities surrounding the enjoyment of riding and appreciating the Harley-Davidson motorcycle! Whether you are already a H.O.G. member looking for a local Chapter to join, or a Harley rider who hasn't yet found the enjoyment of sharing your riding experience with other Harley riders, or whether you're a Harley-Davidson owner "soon-to-be", we want YOU to come check us out and see what all the excitement is about! 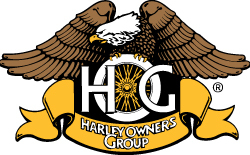 To find out all you need to know about being a member of the National Harley Owners Group, (H.O.G. ), and about being a member of our local Chapter, the "Tuckessee Chapter"; contact our Chapter Secretary, Mary Beth Hershey at, secretary@tuckesseechapter.com and she will gladly answer your questions and help you get signed up so that you too, can start enjoying the FUN! You can also find her at Appleton's Harley-Davidson dealership, during most business days, she works there, just ask for Mary Beth.